After news outlets reported Monday that Governor Scott Walker would not be challenging recall signatures, the governor quietly submitted a request asking that the state elections board accept challenges from an effort involving a Texas organization with a history of voter suppression. On Monday morning, Walker campaign spokeswoman Ciara Matthews announced "we are not filing any specific challenges to any specific signatures today," which led to a flurry of articles repeating the claim. Monday was the deadline for Walker to file challenges to the recall petitions. * "That put us in an impossible timeline," she said. Walker's filing with the Wisconsin Government Accountability Board says his campaign has only been able to evaluate around 350,000 signatures, far short of the 540,000 minimum necessary for a recall. However, Walker also asked the Board to take into account the findings of the "Verify the Recall" initiative, a joint project between the Houston-based nonprofit "True the Vote" and the Wisconsin Tea Party groups Grandsons of Liberty and We The People of the Republic. However, it now appears that Walker and others are working to distance themselves from "True the Vote" and its parent group, the King Street Patriots. Since early February, the groups involved in the "Verify the Recall" effort have been recruiting volunteers from around the country to enter the Wisconsin recall petitions into a massive online database. The database was reportedly developed by "True the Vote," a project of the Texas Tea Party group King Street Patriots, which has been accused of a variety of voter suppression tactics, and is working with a national right-wing organization to purge voter rolls in several states. Last month, the Texas-based King Street Patriots / "True the Vote" and the two Wisconsin Tea Party groups behind the Verify the Recall initiative asked the Wisconsin Government Accountability Board for the chance to officially challenge signatures. Their request was turned down, but they nonetheless continued to analyze the recall petitions and released their findings Monday. Walker's campaign is also asking the Board to incorporate Verify the Recall's analysis of the recall petitions. The groups say that if the Board does not consider their analysis they may bring a lawsuit. Walker Seeks Distance From Texas Group? Since January, the "Verify the Recall" effort had been described as "a joint endeavor" between "True the Vote" and the Wisconsin Tea Party groups (see also here and here). However, in his filing with the Government Accountability Board, Walker only refers to the two Wisconsin Tea Party groups when describing the Verify the Recall effort -- the Houston-based "True the Vote" is not mentioned. Likewise, the Verify the Recall website now says the effort was co-organized by only the Wisconsin Tea Party groups, and "True the Vote" is nothing more than a "contracted partner." As of publication time, "True the Vote's" website still refers to Verify the Recall as a collaboration between itself and the Wisconsin groups. Why might Walker want to downplay the involvement of the Texas-based True the Vote? One issue is that Walker has long claimed the recall effort against him was led by "out-of-state special interests" (despite the governor relying on out-of-state donors for most of his fundraising). Relying on out-of-state groups and individuals to do the legwork for his campaign may not play well, especially when upwards of 20,000 in-state-residents braved the cold and snow to gather recall signatures in the first place. Another issue is that "True the Vote" is a 501(c)(3) "charitable" organization prohibited from intervening in political campaigns, and getting officially involved in the Walker campaign might threaten the group's (c)(3) status. In recent months, a number of other 501(c)(3) groups have gotten involved in defending Walker against recall, including the Koch-funded Americans for Prosperity Foundation and the Illinois-based Heartland Institute. Last week, the Democratic Party of Wisconsin filed a complaint alleging the Americans for Prosperity Foundation violated its charitable status by running ads supporting Walker's reelection. "True the Vote" and its parent group, the King Street Patriots, have previously been accused of violating their nonprofit status and state election laws (and for their defense attorney they hired James Bopp Jr., the anti-campaign finance crusader behind the infamous Citizens United case). Finally, Walker might want to distance himself from "True the Vote" and King Street Patriots based on their alleged history of voter suppression. The King Street Patriots are not only fanatic about "voter fraud" in Wisconsin, but around the country. And they have been involved in a variety of efforts that border on voter suppression. In the 2010 election, the King Street Patriots' "True the Vote" program reportedly recruited thousands of volunteers to patrol Harris County, Texas polling places for "fraud and other problems at the polls." While the volunteers were unable to find any hard evidence of intentional voter fraud, they did draw accusations of voter intimidation from election officials, with volunteers "hovering" behind people as they cast their ballot, "getting into election worker's faces," and blocking or disrupting lines of voters. The incidents, which were described as "systematic and organized," occurred in minority districts and were directed at African-Americans and Latinos. After those elections, the Civil Rights division of the U.S. Department of Justice launched an investigation into the group and its voter intimidation efforts. Despite this, the King Street Patriots are seeking to expand the same initiatives that led to accusations of voter suppression. The group held a national summit last year featuring Andrew Breitbart to highlight their efforts to prevent "voter fraud," and pledged to recruit 1 million Tea Party poll watchers for the 2012 presidential elections. The group also elevates individuals who advocate for other limits to the franchise. 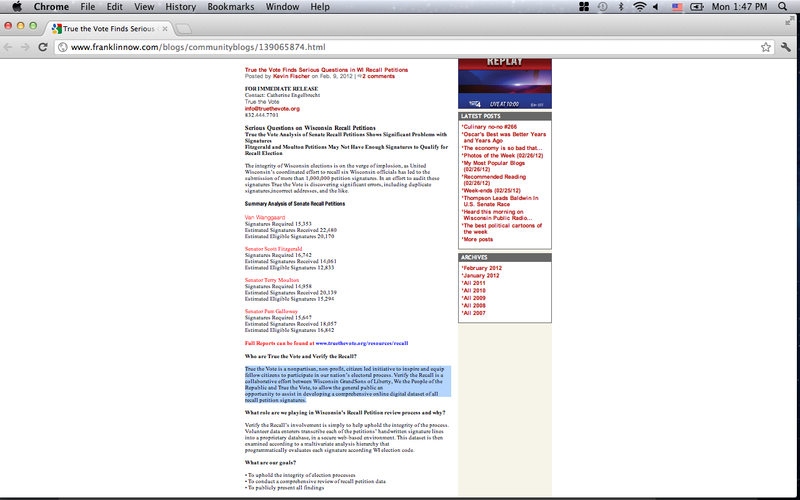 In November, the King Street Patriots hosted a $100 per plate fundraiser featuring right-wing columnist Michael Vadum. Earlier that year Vadum authored an article titled "Registering the Poor to Vote is Un-American:"
"Registering [the poor] to vote is like handing out burglary tools to criminals," he wrote. "It is profoundly anti-social and un-American to empower the nonproductive segments of the population to destroy the country." "America is under siege by radicals who are determined to pulverize the U.S. Constitution, deliberately bankrupt the nation, destroy the electoral system, and drive the economy into the ground. Subversion Inc. isn't just the story of ACORN. It's the story of how community organizers just like President (Barack) Obama are undermining America from within." The King Street Patriots claim their "True the Vote" initiative is "nonpartisan" and "not a political thing." In recent weeks, the King Street Patriots announced their "True the Vote" initiative would be working with Judicial Watch, a conservative legal activist and litigation group, to cleanse the voter registration rolls of individuals they deem ineligible to vote. The groups plan to "pressure states and localities" through lawsuits, if necessary, to "clean up" voter rolls. In Wisconsin, recall proponents gathered one million signatures to recall Governor Walker in just 60 days, and turned them in on January 17, 2012. The number was almost double the amount required, making the recall effort the largest in United States history. More than 40 percent of the signatures would need to be invalidated to prevent a recall election. An analysis by the Milwaukee Journal-Sentinel found that only 15 percent of signatures could not be verified based on other data sources, such as the phone book or voter rolls (which does not necessarily mean the signatures were not legitimate). State law allows the subject of a recall election 10 days to review the signatures and submit challenges. Walker was granted a 20-day extension, then requested a further 14-day extension that was denied. "For [Walker] to suggest that he had a harder time, with warm bodies sitting at desks doing the reviewing, than Wisconsinites standing out in the snow for 60 days, is just ridiculous," said Mike Tate, spokesperson for the Democratic Party of Wisconsin, on a conference call Monday morning. "He had 3 times as much time as is normally allowed under current law" to review the signatures. Unable to complete a review on its own, Walker's campaign asked the elections board to incorporate Verify the Recall's analysis of the recall petitions. It appears that state law prohibited the group from directly sharing its findings with Walker's campaign. Today, Government Accountability Board spokesman Reid Magney says they will not consider the Verify the Recall findings. "There is no legal basis for us to accept third party challenges." The groups involved in Verify the Recall say they are considering a lawsuit against the Board. Walker also requested that the Government Accountability Board conduct its own review of the petitions, in accordance with a Waukesha County court decision that is in legal limbo. Current rules place the burden for challenging signatures on the elected officials targeted for recall, but in January a Republican Waukesha judge told the Board to make a greater effort to screen out duplicate or fake petition signatures. However, that judge refused to allow recall organizers intervene in the case, leading an appeals court to vacate the decision and order a re-hearing. That case has not gone through the second round. The elections board has said they will try to weed-out duplicate, incomplete, or fraudulent signatures. The agency has until March 19 to conduct its review but may request an extension. If the Board verifies all signatures on March 19, the election would be set for May 1, six weeks later. If Democrats have not settled on a candidate the primary election would take place on that date, and the general election would be 4 weeks later, on May 29. If the Walker campaign files any legal challenges -- such as a suit arguing the elections board should accept the Verify the Recall findings -- the recall election could be further delayed. William Dooling contributed to this article. 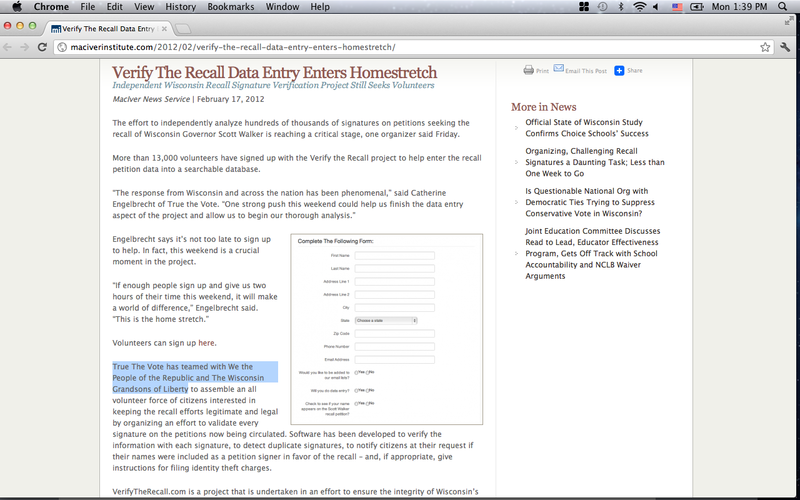 This article was updated at 7:46pm. * Update 10pm: The article erroneously stated that challenges to recall petitions for Walker and all other Republicans facing recall were due on Monday. Challenges for the four Senators were due last week, and for Lieutenant Governor Kleefisch next week. CMD regrets the error. Brendan, Great Op-ed for progressives, but you ignored the facts. When the Wisconsin recall petitions were submitted, the GAB stated that they would not perform their job of reviewing the petitions to ensure the legal recall requirements were met. 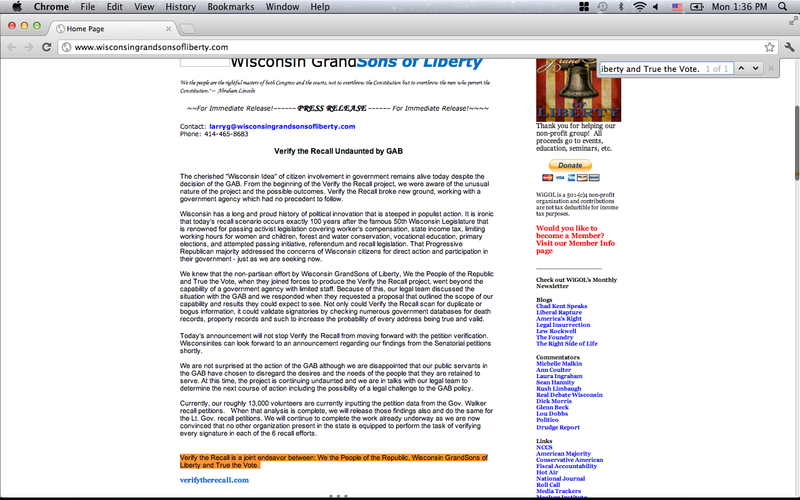 The Grandsons of Liberty and We the People of the Republic; both Wisconsin-based groups, obtained the participation of Texas-based True the Vote as well as 17000 citizen volunteers from across the US to review the petition signatures to identify if there were sufficient eligible signatures to meet legal recall requirements. The results indicate that the number of submitted signatures was greatly exaggerated and that the number of eligible signatures in two of the senator recalls and in the governor recall were close enough to the minimum required number so as to deserve a more detailed review. So the pertinent question is: why is the GAB refusing to do its job and refusing to even consider the information being provided to it by a group of volunteer citizens who attempted to do the GAB’s job for them? You also seem to have some deep-seated issue with True the Vote, a non-partisan volunteer citizen group that stands for election integrity. They exposed a voter registration fraud effort in their home Harris County Texas in 2010 as well as trained over 1000 volunteers in the election laws and procedures. These volunteers then served at the polls requested by both democrats and republicans. This service at the polls in turn documented ~ 1000 election irregularities which were turned over to local and state officials for action. They were rewarded for their actions by the allegations you mentioned, but you neglected to tell your readers that the allegations were investigated and found to be baseless. True the Vote has also partnered with Judicial Watch in an election integrity effort to require states to maintain their voter rolls in accordance with federal election legislation. This initiative has given notice to those counties and states that have more registered voters on their rolls than they have eligible voters that they need to clean up their voter rolls as required by federal law. My final question to you Brendan, is why do you attack and misrepresent the facts about volunteer citizens who stand for adherence to the election laws; whether it be Texas or Wisconsin? I was a poll worker in Harris County, Texas for the 2010 election. During that election I saw: Shelia Jackson Lee campaigning in the voting area. Poll workers showing voters for whom to vote. (actually touching the machine!) A driver for the democrat party, who drove voters to the polling place, attempt to show voters how to vote. This is clearly a violation of the election law in Texas. If there were not poll watchers I am sure that more fraud would have taken place. True The Vote is non-partisan. It has even trained democrat poll watchers. TTV poll watchers have been requested to assist at polling locations supervised by democrat election judges. Verify the petition, Walker and TTV. True The Vote is an organization interested in honest elections for all registered voters, irregardless of political affiliations. Seeing a need and stepping up, TTV took on the task of verifying over three million recall signatures in 22 days. Thru an amazing mouth to mouth network, over 14,000 volunteers were mobilized to verify each page, each signature. Their objective was verification, not outcome. TTV, the verify volunteers and those who signed the petitions, are citizens stepping up, getting involved and exercising their rights under The Constitution.